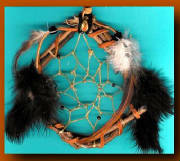 For many years, I have gifted friends, family and partners in the healing work (I do not like the word client or patient) with Medicine Bags, Dreamcatchers or Shields. They were and are another way to bring healing into the lives of people. Many times I have been encouraged to create them for the market place and I always declined. Now, through guided vision, is the time. The world is wanting. The work is needed. The people are ready and so am I. 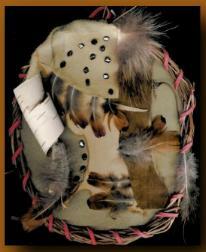 Each Medicine Shield, Medicine Bag and Dreamcatcher has it's own unique design - no two are alike. 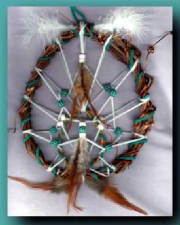 In designing and creating a Medicine Shield, Bag or Dreamcatcher I use the information you provide on the Order Form. Special requests or desires are always responded to, for example: dealing with an illness; blessing/protection for a home; having difficulty in a relationship or on a job. Through meditative prayer I offer up the information received from you and allow Spirit to guide me in my choice of design and materials used. To the best of my ability, I use all natural materials; the grapevines used to create the hoops are grown in my own garden; natural crystals, gemstones, real feathers, animal skins and furs and glass beads are used. Each brings a special "medicine" (energy) to the owner. Throughout the creative process I add prayers to the work, asking that "That which is in the Highest Good be Manifest" for the buyer. I incorporate the requests and needs of the customer with the information received through prayerful meditation and guided vision. Each design is "Spirit" lead. 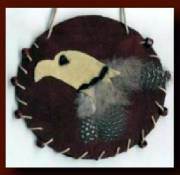 When you receive your Medicine Shield, Medicine Bag or Dreamcatcher you will also receive detailed information about the materials used and the "medicine" (energy) that is being reflected or called in. 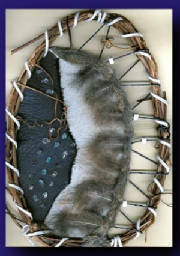 This "medicine" (energy) is gifted to us from our Animal sisters and brothers (the skins, furs and feathers); and the Earthmother (grapevines, crystals, precious metals, crow, pony and seed beads); For example, deer skin reflects or calls in "gentleness", amethyst crystal reflects or calls in "medicine" which is useful in dealing with sleeplessness and anger, grapevines remind us to bend, lest we break. 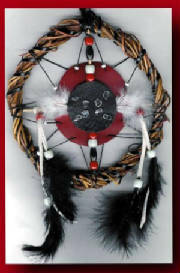 According to Native American tradition, the "Medicine Shield" is hung to guard one's space - sleeping area, workspace, and or home. In times past, warriors carried their shields with them. A Shield brings in and/or reflects unique energies and properties. Native Americans call this "Medicine". The Shield reflects (tells the story about) the unique "medicine" of the individual who bears it as well as calls to that person or place the "medicine" of the shield. 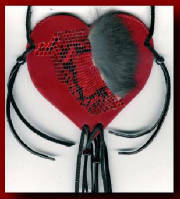 The Medicine Bag or Pouch is a smaller, personal carrier of the Medicine Bundle. In Native American tradition, the Medicine Bundle was a collection of items that came to an individual in a variety of ways (gifts given, things collected, etc.) and represents the Totems of that person's Power Animals or Allies among nature. It contains anything that represents "medicine" to the Bundle's owner. In my Medicine Bag I carry crystals, a bluebird feather, offering tobacco and my son's first lost tooth. The personal Medicine Bundle can be worn, carried or placed upon your sacred space/altar. 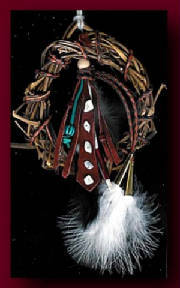 These Bundles are called on when needed for strength and/or courage during daily activities. Some Bags are worn around the neck, some around the waist. These Medicine Bags are a reminder of the talents, abilities and power Animals who will aid you in walking tall and in balance. They are also for protection. 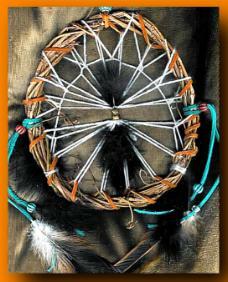 The Legend of the Native American dreamcatcher varies somewhat from tribe to tribe, but the basic theme or intention remains the same: good dreams/visions slip through the web and into the sleeper, while the bad dreams/visions are caught in the web (Lakota legend states the reverse). As my grandmother taught me, I pass on to you - "one must be careful in judging a dream or vision and calling it "BAD", the Grandmothers of the Sleep Space send you messages through your dreams. Often we call things bad just because we don't like hearing what is said". 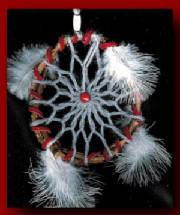 Originally, Dreamcatcher hoops were made out of willow and covered with sage, the web was made from deer sinew, the use of which is now forbidden. 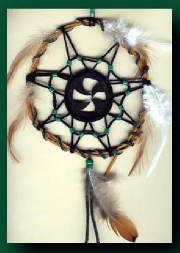 The design of the modern dreamcatcher is left to the artisan's imagination. I take into consideration the use, i.e., a petite shield for hanging in a car (approx. 3 inches in diameter) will be much smaller than one designed for hanging in a home. Prices therefore vary depending upon the size and intricacy of design. Once I have determined the design features, I email each customer with the cost. Payment is made at that time, through a secure server. Taxes, Shipping and handling charges are additional. 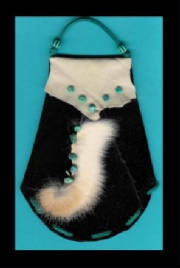 The Medicine Bags shown here are made with suede, leather or deerskin and are handsew. To each has been added various items, adding beauty and calling in particular "medicine" to the wearer: snakeskin, rabbit fur, grouse feathers, glass crow and pony beads, clear quartz, hematite, turquoise, onyx and garnet crystals were used.